If you've never seen these, the fact they exist is utterly shocking. In fact, if you've never seen either of these - and especially if you've never heard of them - you owe it to yourself to stop reading and watch the original. It's under nine minutes and easily found on Youtube. Here - I'll make it easy. For those of you ignoring my advice, I'll summarize. Both versions open with the song "Hark the Herald Angels Sing" being sung on Christmas Eve, with altered lyrics. 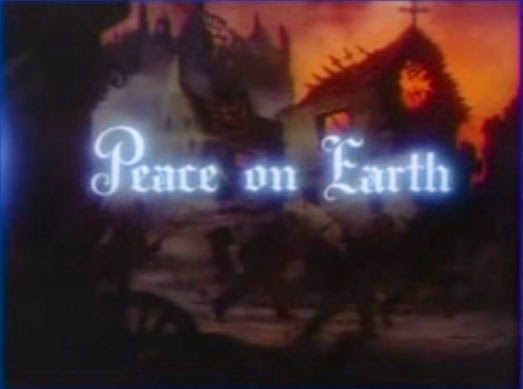 The setting varies a touch: Peace on Earth is occurring in what looks like a quaint European village (though the houses look like helmets), while "Goodwill to Men" is occurring in the ruins of a church. We zoom in to be introduced to the narrator, a relatively generic elderly cartoon animal (squirrel in the original; mouse in the remake). The squirrel is visiting his grandchildren, while the mouse is conducting a bunch of choir mice. But both versions are focusing on the song, and in particular the lyrics "Peace on Earth, goodwill to men." This prompts one of the younger animals to ask, "What are men?" At this point, it becomes abundantly clear that we're seeing a post-apocalyptic world where humans have wiped themselves out, and animals have taken over the planet. The grandfather/choir director is old enough to have seen men, but his impression was somewhat skewed. He remembers them only as soldiers and mistakes their gas masks for part of their faces. Mostly, though, he remembers them fighting and killing each other. He remembers them making more and deadlier weapons. In the original, he tells how mankind fought until there were only two humans left and they killed each other rather than seek peace. The '55 version updates the resolution to mutually-ensured nuclear destruction. In the aftermath, animals found a copy of the Bible and rebuilt civilization upon its rules; in particular, "Thou shall not kill." That brings us back to the start. And it leaves the audience with some uncomfortable questions. I actually think they left us with at least one more question than they'd intended, but I'll get back to that in a minute. The shorts certainly aren't subtle, but the animation alone is enough to make these required viewing. Add on the sci-fi aspects, and it's even more fascinating. Likewise, the tone of the war scenes is incredibly dark, and the cute animals and holiday music only make it seem more so in contrast. Now. Let's talk about the theme, the moral, and the aspect of these I find even darker than the intended subject matter. Obviously, these were anti-war stories. They've been honored as such ever since and for good reason: they do a fantastic job portraying the horrors of war and the futility of hatred. When the United States is pulled into unnecessary wars like Iraq and Vietnam, it seems horrifically prophetic. However, the original wasn't made to protest the war in Vietnam. It was made in 1939, at a time when war was engulfing Europe for the second time that century. And it was made in the United States, where nonintervention was an extremely popular sentiment. We now know that our hesitation to become involved cost an immense number of lives. The moral I take from something like this is that we, as a nation, need to become far better at determining when to fight and when not to. Unchecked aggression will end in mutual destruction, like these shorts suggest (probably not with the extermination of the entire human race and rise of an animal empire, but you get the point). But adhering to a strictly pacifist philosophy implicates us in the horrors we're capable of preventing. I'd like to hope that our species might one day develop the wisdom to analyze the likely outcomes of different actions and make intelligent, well-informed decisions, rather than picking unnecessary fights or following ideological rules. But let's be honest: the squirrels will probably get there first.